Can be easily wiped without leaving a trace. Fast drying, low odour. All sets convert to a practical desk stand. Pocket clip on cap.Bullet Point 2.0mm Line WidthThis product is sourced from Small and Medium Enterprise. With dry safe ink technology you can leave Lumocolor Markers uncapped for days without drying out. 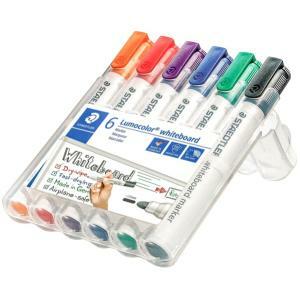 Fast drying, low odour, alcohol based ink can be easily dry-wiped from whiteboards. Convenient pocket clip on cap. Bullet point markers with 2mm line width. Assorted set of 6 includes black, blue, red, green, orange and violet. Wallet converts to a convenient desk set.